More women are experiencing hot flushes post menopause and the good news is that progesterone really does make a difference to your symptoms, whatever your age. This heartening news comes from Vancouver where the The Centre for Menstrual Cycle and Ovulation Research published their results of a trial of progesterone for hot flushes and night sweats in healthy postmenopausal women. They were using an oral form in a very high dose, as the majority of the progesterone is lost when processed by the liver, but their research found that micronized progesterone (the same found in progesterone cream) offers an additional and effective therapeutic option for the treatment of hot flushes and night sweats in healthy women early in postmenopause. After 12 weeks of progesterone treatment, women who began the study with a daily average of seven hot flushes or night sweats reported having three fewer episodes each day. This Canadian study is the first to show that progesterone may reduce frequency and severity of hot flushes and night sweats, says co-author Dr Jerilynn Prior, an endocrinologist at the University of British Columbia. This also backs up anecdotal evidence that post-menopausal women who take progesterone can have fewer hot flushes and night sweats. She theorized that progesterone offers relief by raising core temperature and driving up the body’s comfortable temperature zone. Alarm about estrogen therapy has left many postmenopausal women “suffering in silence,” according to a statement from the US Endocrine Society. A poll commissioned by the society found that 72 per cent of women aged 45 to 60 experiencing hot flushes, interrupted sleep and vaginal dryness had not received treatment for their symptoms. A recent study has shown that a much higher proportion of ‘older’ women (average age 59 in this study) still suffer from hot flushes well after menopause is assumed to be over. Oestrogen dominance is a factor, as are stress and anxiety as all of these can affect your hormone balance. There are options available to help with hot flushes from dietary support, exercise and stress reduction and certainly the experience of many women is that supplementing with bioidentical progesterone is the key to getting their flushes under control. 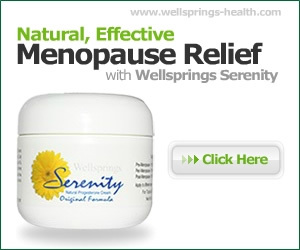 Although progesterone can help for most women, if your flushes are severe – and you have any symptoms of low oestrogen such as vaginal dryness – then you may be better with a combination cream with the majority ingredient of progesterone with two natural oestrogens added.